Application launchers like Alfred and LaunchBar are Swiss Army knives of software, but to take full advantage of their flexible power you really need to tweak and customize their settings. The apps aren’t designed for academics, but because they’re so versatile they can be bent to our purposes—and with very little effort. Take custom web searching. I tend to search particular sites—like my library’s catalog or Google Scholar—over and over again. 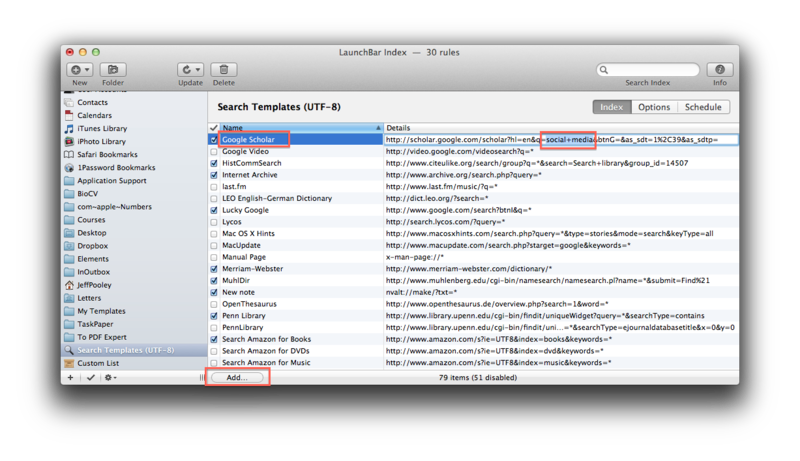 Alfred and LaunchBar, along with the original launcher, Quicksilver, make it dead simple to create custom searches. Here I focus on my favorite, LaunchBar, but setting up custom web queries is similar on Alfred (directions) and Quicksilver (directions) too. Next, invoke LaunchBar, and open up LaunchBar’s index. 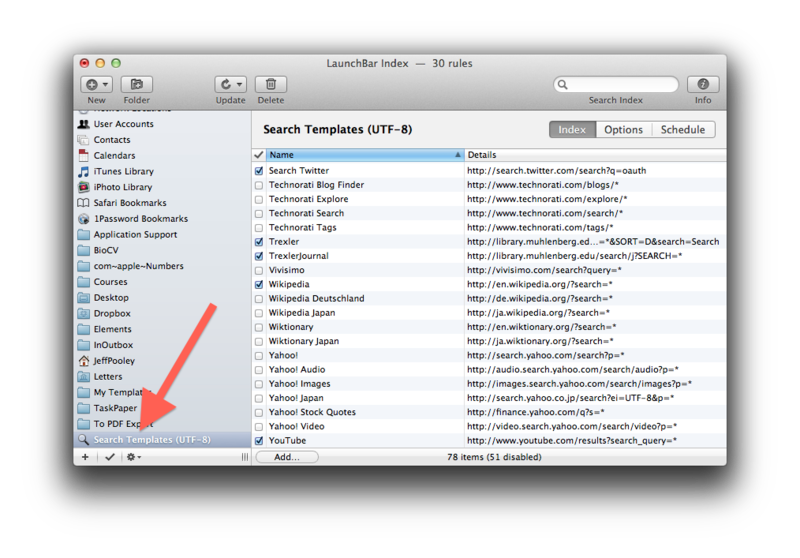 In the left sidebar select “Search Templates (UTF–8)”. You will see that LaunchBar has pre-populated the window with a number of searches. Select and de-select the check-boxes to enable or disable the pre-installed searches. To add Google Scholar, click the “Add…” button, type “Google Scholar” in the name field, and paste the url you’ve copied into the “Details” field. Just be sure to replace your arbitrary search terms with an asterisk (“*”)—the symbol that LaunchBar uses to trigger the fill-in. Now invoke LaunchBar, begin typing “Google Scholar”, and hit the space bar. And then search away. Especially useful are LaunchBar searches customized to your campus. I’ve added my college’s main library search, as well as its journal title search. Since I refuse to use my institution’s standard Groupwise email client, I have also added the campus directory—using the same technique: (1) dummy search; (2) copy url; (3) add new custom search in LaunchBar; and (4) replace the dummy term with an asterisk (“*”). All of these custom searches, if you assign pithy LaunchBar abbreviations, will soon be stored your muscle memory. This entry was posted in Automation, Workflows and tagged Launchbar, NValt. Bookmark the permalink. Great post, Jeff! And refusing to use GroupWise sounds soooo familiar! It’s always seemed to me that GroupWise has as much intelligence as groupthink. This is really helpful. Another useful one for me is a search template for JSTOR that already contains my University’s proxy information.